In Shulchan Aruch (Orach Chaim 96) it is stated that one is not allowed to hold any object while davening because it will worry him that it may fall and take away from his kavana. However one is permitted to hold onto something that is needed for the prayer itself (i.e. a Machzor or a Siddur, Lulav and Esrog) thus it will not take away from his kavana. Fidget spinners have been marketed as toys that are helpful for the autistic and for children diagnosed with ADD. Supposedly, fidget spinners and fidget cubes are claimed to help with aiding the children's concentration during class. Many schools and teachers allow them in their class for this purpose. If using a fidget cube/spinner helps one focus on the teffilah, may one hold/spin it while davening? Are there any other factors beyond concentration that may allow or disallow their usage? Someone had apparently asked הרה״ג רבי יצחק זילברשטיין שליט״א if he is allowed to use the "spinner" during Shemona Esrei since it is hard for him to concentrate, and according to the researchers he will be more successful at concentrating during the Tefilah. 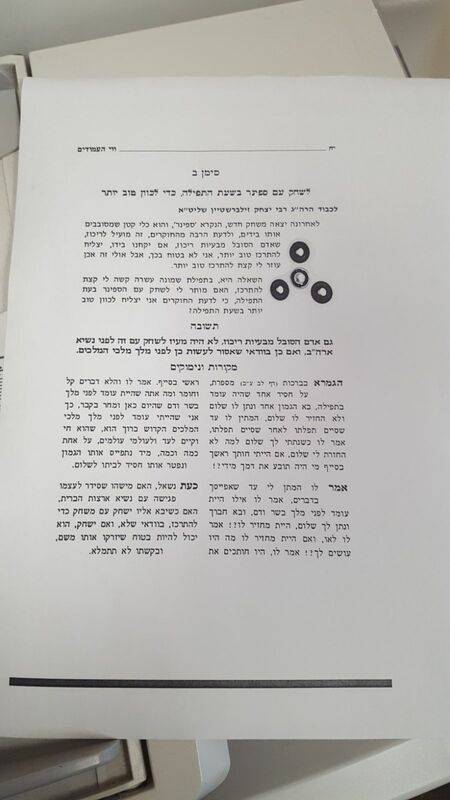 רבי יצחק זילברשטיין responds that even someone who is suffering from "problems with concentration" would not be brazen to use a fidget spinner in front of the President of the USA, and therefore it is certainly forbidden to do so in front of The King of Kings. The page within the sefer is titled ווי העמודים although I am unable to discern which volume, etc. it may be. Not the answer you're looking for? Browse other questions tagged halacha prayer-book kavana-concentration . May I daven wearing headphones? How can I stop spacing out during davening? Davening from an electronic device? How is davening from an app allowed?